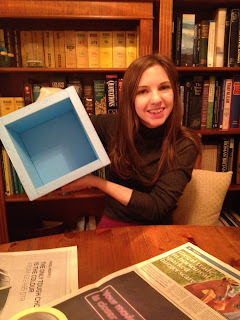 Buying a pre-made polystyrene (styrofoam) insulated box. Commonly referred to as fish/cold boxes that are used as packaging for transporting chilled goods. Examples can be found here. 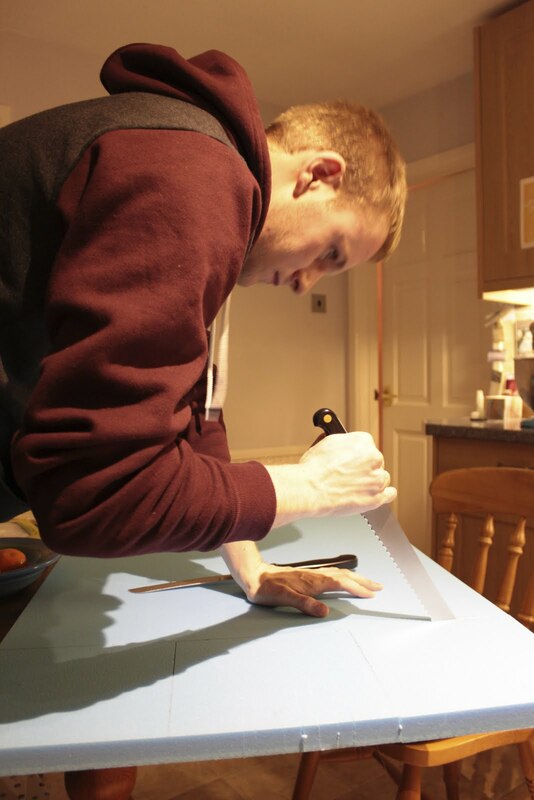 Making your own custom made design from polystyrene sheeting. After a bit of research, we decided on making our own. This would allow us to create precisely the size we needed, something that our components would fit tidily into and into which we could also include internal compartments. Furthermore, the available pre-made sizes seemed to be rather heavy so we figured there was a weight saving to be made with a DIY box. A heavy payload before we'd even filled it with components = bigger balloon, more helium, bigger parachute, which in turn = more £££s. Something to be avoided wherever possible. After a brief chat with the good people on UKHAS we were directed to the Hindleys website. We purchased two sheets of the 600mm x 1245mm x 25mm Blue Styrofoam. We only needed the one - but better safe than sorry. 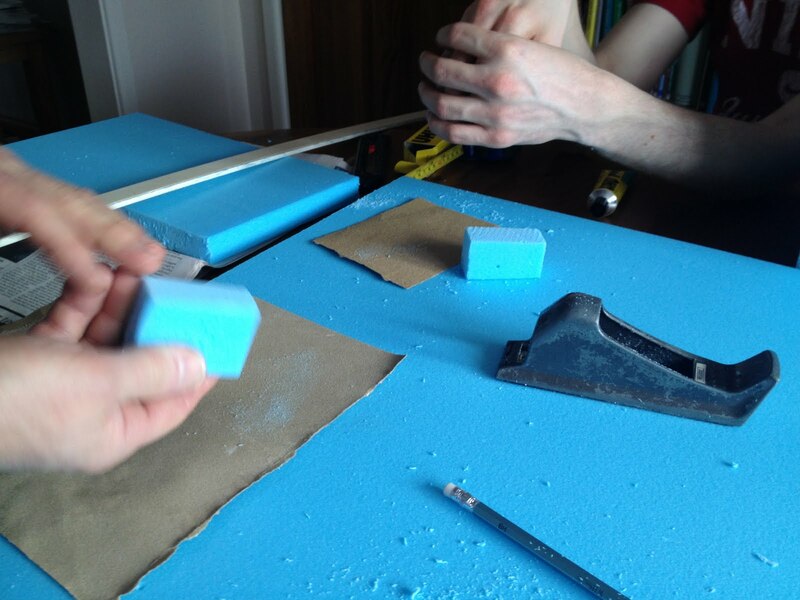 We were advised that the blue styrofoam made less mess when cut than the white. Less hoovering, excellent. We also purchased some UHU Por glue from eBay. 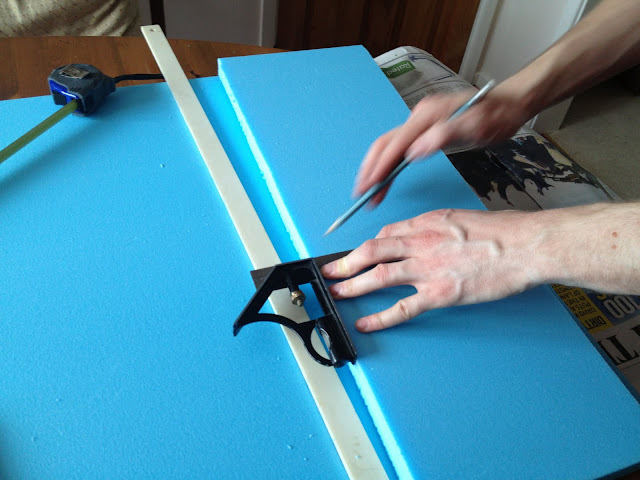 Regarding cutting the polystyrene, we looked into the benefits of a hot wire cutter but since we were only cutting straight lines we decided to take our chances with household tools. Saw was rubbish. Bad idea. 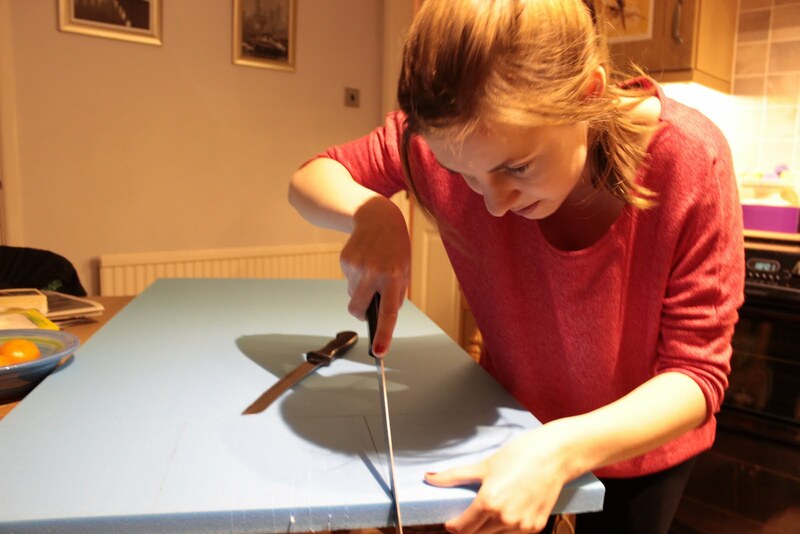 The trusty Stanley knife ended up being the tool of choice. 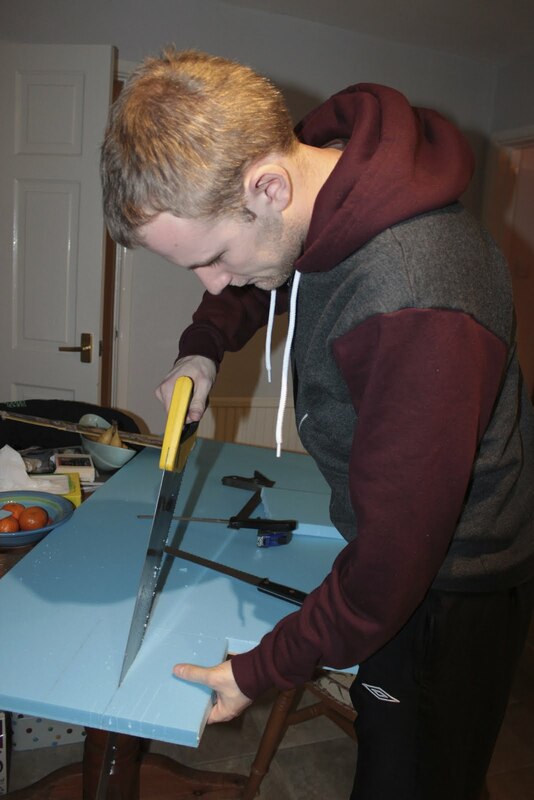 Measure twice, cut once and all that. Planing and sanding for a smooth finish. Last week we had our first attempt at taking some photos of the night sky. Still playing around with all the different SLR settings but we've uploaded some of our first efforts below. These were taken at Symonds Yat Rock on a very cold evening! Backup Tracker - just in case! We're thinking about putting my GoPro Hero 2 into the payload to get some hopefully decent video of the journey up and down. This is quite an expensive camera and I don't really want to lose it(! ), so have decided to put in a backup tracker to work along side the primary radio tracker and act as a bit of a fail safe in recovery. I'll do an extensive primary tracker write up very shortly - it has been quite a lengthy process and we're still not completely finished with it. It has a decidedly Made in China feel about it, not more so evidenced by the 'Chinglish' instruction manual that was included, but it does everything we need! It even came with two rechargeable batteries and a charger. I got a SIM card from the shop and stuck a fiver on it to test it out. This thing is great, in its most simple mode all you have to do is turn it on and leave it to do its thing, you just dial the SIM phone number from another mobile and it will answer and hang up the call. A few seconds later you receive a text message with the location of the device - along with a link to Google maps if you want it! You can also set it so that you automatically receive a text message every 30 seconds or so to a predetermined set of numbers. Interestingly you do all of the configuration of the device from another mobile - sending commands via text. 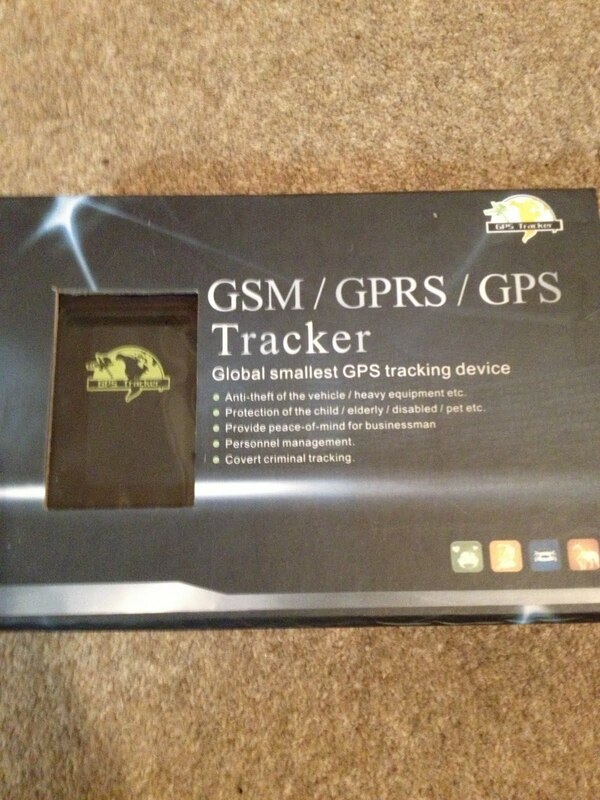 If you want to get more advanced, you can take advantage of its GPRS functionality. Instead of sending information via SMS, it will use the mobile internet (GPRS not 3G) to send its location to a central server on the Internet. You can then view it on a map from your PC/Mobile. The benefits of this is it probably cheaper than the 12p a text you pay on SMS mode and you get the added Internet tracking functionality. The problem however is that GPRS (2G) signal is not as widespread as the GSM (1G) network so if it landed in some hills or another forest, we need to use the signal that is most likely going to be available. For us, I think we are going to leave it in SMS mode and have it send us a location every minute or so. We're expecting the mobile signal for the device to be lost at some point during the flight so that is another consideration we need to think about. The main purpose of it is for us to use it when the payload is back on the ground waiting to be found! 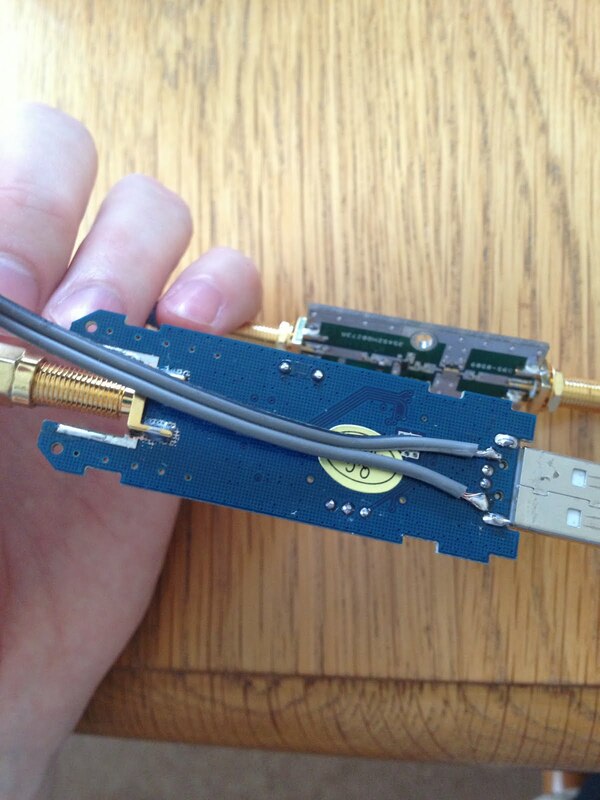 Experienced enthusiasts often use a proper HAM radio receiver to listen to payloads. These are robust pieces of kit and are really the correct tool for the job, however there is usually a large (£100+) cost for even the most basic second hand receiver. I know that we could have bought one and sold it on again afterwards, but for our first launch it was just too much of an outlay at the beginning. This almost jeopardised the whole project before we even began - if we couldn't track the balloon then there wouldn't be much point in launching. Soldered 5v header from usb to the HABAmp. In the first few days after deciding to start the project, we had read this on the UKHAS wiki page. It detailed how in theory you could use particular USB dongles that were originally designed to fit into your PC and receive a TV aerial and signal to instead, receive signals that were usually outside of TV frequency range. Once you could receive the signal, you could then use software to listen to it and pass it on to whatever other software you like. This was much more within our initial budget so we went for this option to see how well it would work out. The answer is, very well. I bought the dongle and highly recommended 'HABAmp' from the HABSupplies store. From my experience now, you definitely need the HABAmp for this to work successfully. When testing without the amp, we were losing signal almost instantly when moving away from the tracker. The amp does need its own 5v supply which I took from the USB header inside the dongle. 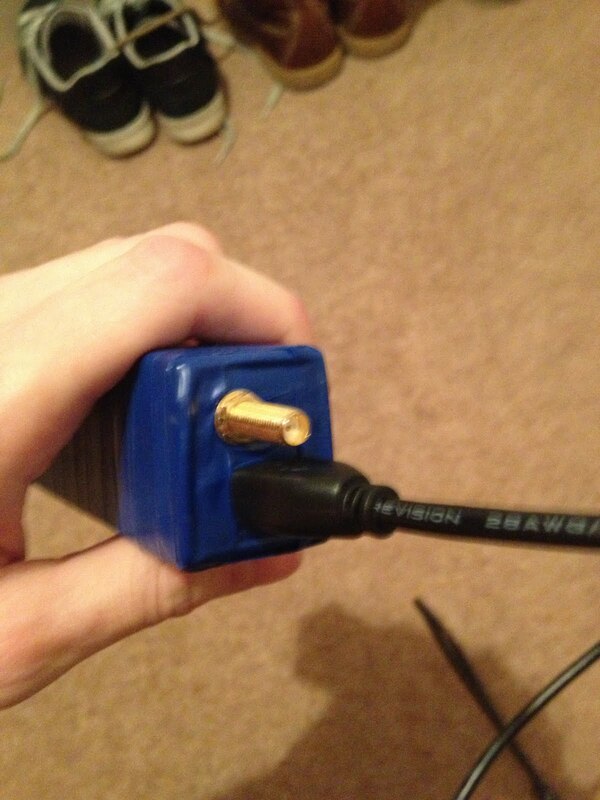 adding the amp with my router aerial. Following the wiki page was straightforward and I installed the drivers and software with no issues. One thing to note about that page is that we didn't need to download Virtual Audio Cable or similar software, I just configured the Windows Vista/7/8 "What U Hear" functionality. Something that I had to consider was the fact that I wasn't able to be fully sure that everything was working until the tracker was giving out a signal. This was difficult at first, but when I was reasonably confident in the receiver, I started on the tracker until I got to a point that I could test both. Not the most scientific approach but it was all I had! Initially I had no antenna to test with, so before doing any research I just grabbed my router aerial as I could see it had the same SMA plug on the end - this didn't really work. 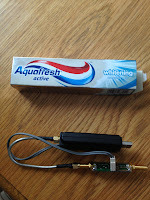 Learn from this mistake and buy or make yourself a proper antenna from the outset! 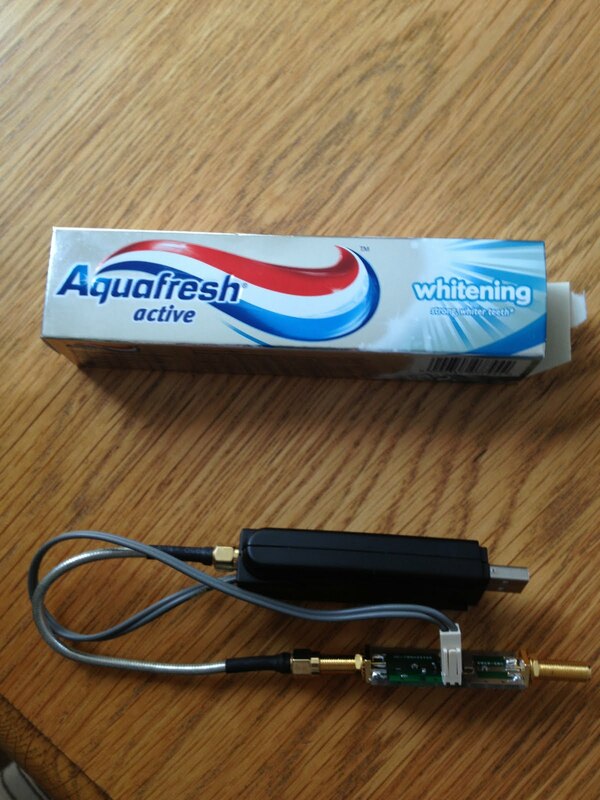 Once I was happy that all was working I needed an enclosure to put it in - the chinese takeaway box I was using just did not cut it for professionalism anymore, so instead I commandeered a new toothpaste tube box! This was a perfect fit and gave a smart look to what is essentially a USB dongle and another circuit board in a toothpaste box covered in tape! I cannot stress enough how much you need a decent antenna for this to work. 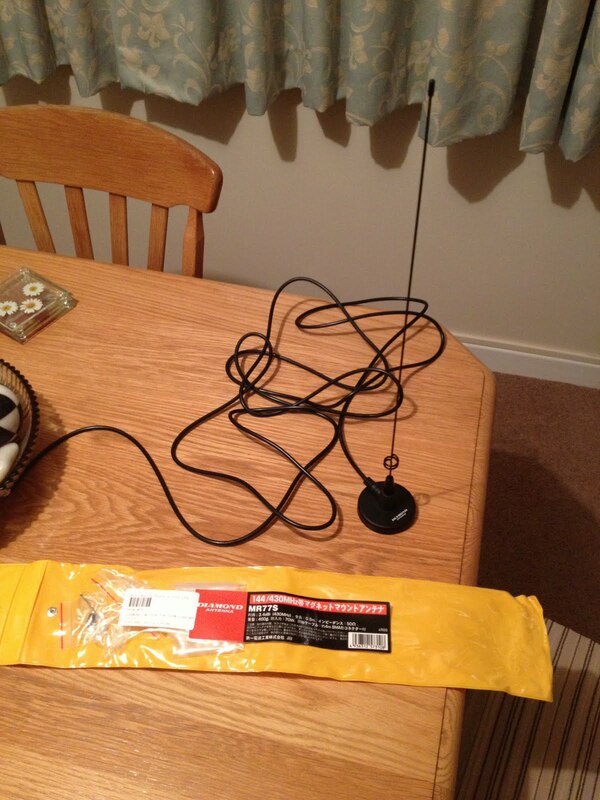 After talking to a few guys on the #HighAltitude channel on freenode IRC, I went for this half wave antenna from http://www.hamradio.co.uk/. Half wave means exactly what it sounds like, the length of this antenna is exactly half the length of the whole wavelength that I am looking to receive. 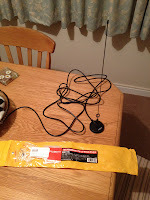 I had the chance to test this from a room in our house, tracking another enthusiasts' balloon from 50 miles away! Was a great feeling knowing that everything was working. One step closer to a DIY Payload! BREAKING NEWS: Never before have we been so excited for the delivery of a cardboard box containing nothing but polystyrene. Time to get started on the payload! Now that the Christmas and New Year celebrations have come and gone, we have had chance to catch up on where we are and what we have still left to do! A basic tracker which has gone through a few iterations of building and testing, but we think we are nearing completion now. 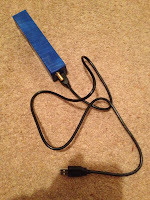 A working USB dongle based receiver and suitable antenna for the chase car. 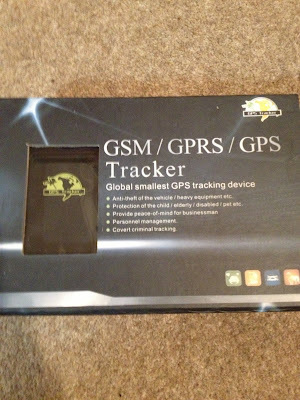 A backup GSM based GPS tracker that will send us text messages when near the ground to assist with recovery. Cameras to go in the payload. Keep an eye out here on the blog for the write up we'll be adding within the next week, giving more detail on our tracker, receiver and back-up tracker. Balloon - still waiting on a confirmation of the final payload weight before we can order this one. Payload box - we're evaluating ready-made vs. designing and making our own. 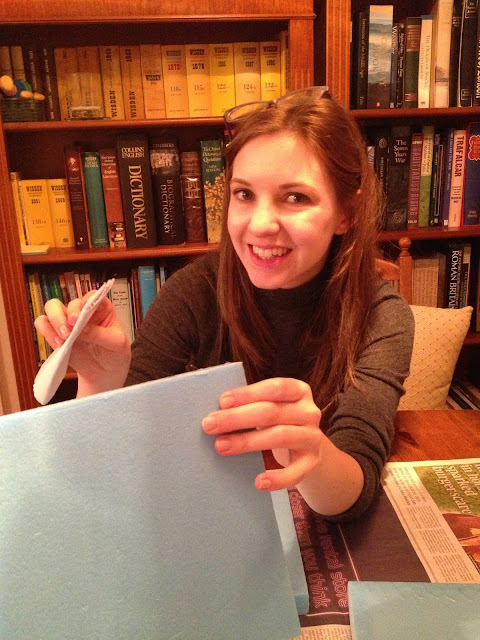 Helium - dependent on payload weight and balloon capacity. Twine and cord to tie it all together. Probably something else that we have missed!